Education is important. Unfortunately, it’s also expensive. Most people can’t afford to pay the costs of higher education out of their savings or current income (and some students don’t have any income), so they turn to student loans. But it’s critical to understand how student loans work and how to use them before you borrow. Student loans can be a form of “good debt”—an investment in an education that would otherwise be unattainable. It often pays off: Workers with a college degree tend to earn about $20,000 more than those with a high school education each year. Apply for grants and scholarships to reduce the amount you borrow. Even small grants help. Work part-time to pay some of your education costs. You might gain valuable life experience that many of your peers won’t receive until after graduation. That head start helps you make important decisions earlier in life. Evaluate less-expensive schools and in-state education. After graduation, how much will it matter where you went to school? Cut costs where you can. Used books, inexpensive entertainment, and homemade food can yield significant savings. Every time you receive funds from a student loan, remember that you’ll have to repay all of that money (plus interest) at some point in the future. Student loans are unique because they are designed specifically for education funding. But what makes them different from credit cards and other loans? Federal student loans, offered through the U.S. government, have borrower-friendly features. Interest rates are relatively low and are fixed for new borrowers, so you don’t have to worry about dramatic changes in your interest costs or payment shock. Interest costs might be subsidized (or paid by the government) for some students. 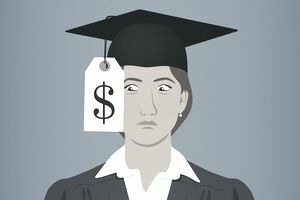 Student loans are relatively low-risk loans for lenders, and some lenders see a degree—especially in certain fields—as an indication of income available to repay your loan. Easier approval: Most students don’t have high paying jobs or high credit scores. As a result, they might not get approved for any loan other than a student loan. Federal student loans typically don’t require any minimum credit score, but some issues in your credit history can disqualify you. As your first loans, these loans can help you establish credit. It’s critical to pay on time so that you can more easily qualify for other loans in the future. Benefits at payback time: Some student loans offer borrower-friendly features that make repayment more manageable. Loans through government programs are best, but private lenders provide flexible terms as well. In-school deferment: With some loans, you don’t have to start making payments until you’re out of school, which allows you to focus on your studies. During that time, interest costs on subsidized loans may even be paid so that your loan balance doesn’t increase. Unemployment: Some student loans, especially federal student loans, offer unemployment deferment. Under that scenario, you can stop making payments until you find a job. Limited income: Federal student loans can adjust your required monthly payments when money is tight. If you sign up for income-driven repayment plans, you can avoid burdensome payments. Potential tax benefits: Interest you pay on student loans may help reduce your taxes. However, the benefits may be limited due to your income and other factors on your return. Loan forgiveness: It may even be possible to have your student loans forgiven. Borrowers with federal student loans may qualify for forgiveness after ten years of payment and employment in certain public service jobs. Others, on income-driven repayment plans, might qualify after 25 years—but forgiven balances may be taxable as income. You can borrow from any lender you want. However, loans offered through government programs are typically the most affordable, borrower-friendly, and easy to qualify for. As a result, it’s wise to use those loans first. After borrowing everything you can with government loans, you can turn to private lenders if you still need more. Those lenders are typically banks, credit unions, and online lenders. They might market the loans as “student loans,” or they might offer standard loans that you can use for anything you want. Approval: Private lenders typically require you to qualify for approval. As a result, you need good credit and sufficient income to repay the loan. Many students don’t have either, so a parent (or somebody else with good income and credit) often applies for the loan or cosigns the loan with the student, which makes both people 100% responsible for repaying the loan. Variable rates: Newly-issued federal loans have fixed interest rates, but private loans can have variable rates. As a result, you take more risk—if rates rise significantly, your required payment could also increase. Start with your school’s financial aid office and ask what types of aid are available. Be sure to discuss grants and scholarships as well as loans. Fill out the FAFSA form, which gathers information about your finances. The U.S. government and your school use that information to determine your “need” for financial aid. Complete your FAFSA as soon as possible every calendar year. Just do the best you can when filling it out—you can go back and update any estimates later in the year. Apply for aid with your school’s financial aid office and through any other promising sources, and wait for the results. If approved, you can decide to take all or part of the aid available, and you’ll probably need to complete an introductory entrance counseling session to learn how your loans work. For private loans, find a lender and complete a loan application with that lender. Determine when you need to repay. You might not have to start paying immediately, but it’s critical to understand when payments are due. As you go through the application process, it’s helpful to be familiar with the most common types of loans available through the U.S. government. Perkins loans should be your first choice—if you can get one. They feature a low, fixed interest rate and are available to borrowers regardless of their credit history. However, they are need-based loans, meaning they’re not available to everybody, and they are in limited supply. Stafford loans are also easy to qualify for, and they provide more money than Perkins loans. In addition, interest costs might be subsidized, and they are available for graduate students as well as undergrads. PLUS loans are closer to private loans, but they are federal loans. They require a credit review, and repayment starts soon after disbursement. PLUS loans for undergrads go to parents, which allow them to cover significant expenses for their children. In recent years, these loans have gotten bad press because parents can get stuck paying off PLUS loans for the rest of their lives. Consolidation loans are loans that combine multiple student loans into a single loan. The result is simpler repayment (one payment instead of many), and there may be other benefits. Consolidation works differently for federal and private loans. Learn the differences before you decide to consolidate or mix federal loans with private loans. If you combine those loan types, you may lose valuable benefits only available from federal student loans.